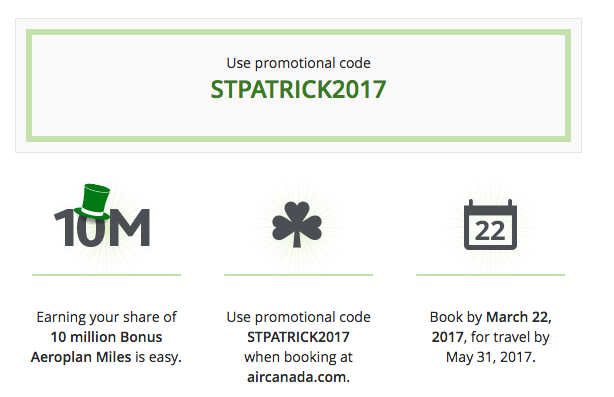 Air Canada has brought back their ever popular St. Patrick's Payout promotion where they will award a total 10 Million Aeroplan Miles for bookings made with the promo code STPATRICK2017. The 10 Million Aeroplan Miles will be split among all people who book with that code by March 22 for travel until May 31. Darn I just booked before this but I won't complain as Business Class was only $31 more than Economy, so you can guess what class of service I booked for our family for spring break. Sorry got off track there! Anyways you will receive a minimum of 500 bonus Aeroplan Miles when you do book with the code but that bonus can get higher if the total amount of bookings divided by that 10 million works out to more than 500 - that mean's less than 20,000 bookings. Find many more Aeroplan Bonus Mile offers here! • 50% Annual Fee Rebate for the first year (Primary Cardholder only) – that’s $60 in savings! • Enjoy an extensive suite of travel insurances for peace of mind on your next getaway.